Michael Geertsen (Personal show 2014). Bodil Manz is universally recognized on the world stage as one of the true masters of eggshell porcelain. For decades, she has amazed us with her finely wrought porcelain. Now she takes us ever closer to the edge of what is possible with her favorite shape, the ultrafine and almost impossibly thin and exquisitely decorated porcelain cylinder. Once again, we are astounded with her ability to capture the most ethereal nuances of transparency and pattern. Born in Copenhagen in 1943, she studied ceramics at the School of Arts & Craft in Copenhagen, then at the Escuelo de Diseno y Artesanias in Mexico and the University of California in Berkeley, California, USA. Her works are among the most prized possessions in virtually every major private and museum collection around the world. The MoMA in New York, the Victoria and Albert in London, and the treasure troves of porcelain housed in the dedicated ceramic museums throughout Asia and Australia are only a few of the proud owners. These near paper-thin slip cast porcelain cylinders are so remarkably translucent, you can sometimes even discern the light and shadow passing through both walls of a piece. 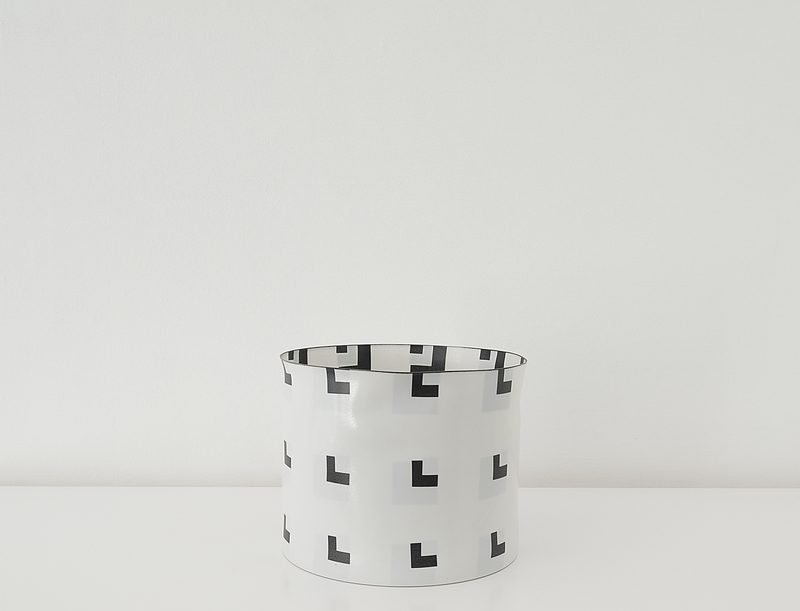 Manz applies decoration in the form of abstract geometric lines and patterns on both the inside and the outside of the cylinder. This is accomplished using a transfer, which then melds with the raw body of the object. The outer and inner decorations become one. There is a wordless interaction between the delicate, precise vessels and the geometrical decoration, regardless of whether it is a delicate line drawing or a strong, large field of color. The effect is a pattern on the one side, offset by a shadow of a related pattern on the other. Only when she deems it ready is it submitted to the final stage: high firing at 1,300 degrees. “That is when I give it out of my hands into the fire, to alter the shape and line of the vessel as it will.” Sometimes this alteration is barely perceptible, while at other times the whole form torques into a subtle, liquid undulation or slumps slightly to soften the line. The interior and exterior of the piece simultaneously play off one another and merge to form a complex yet intrinsically subtle whole. This is stunningly evident in every piece that leaves her studio in Denmark. Besides her cylinders, Manz also designs tea and dinner sets and has executed large-scale architectural pieces. 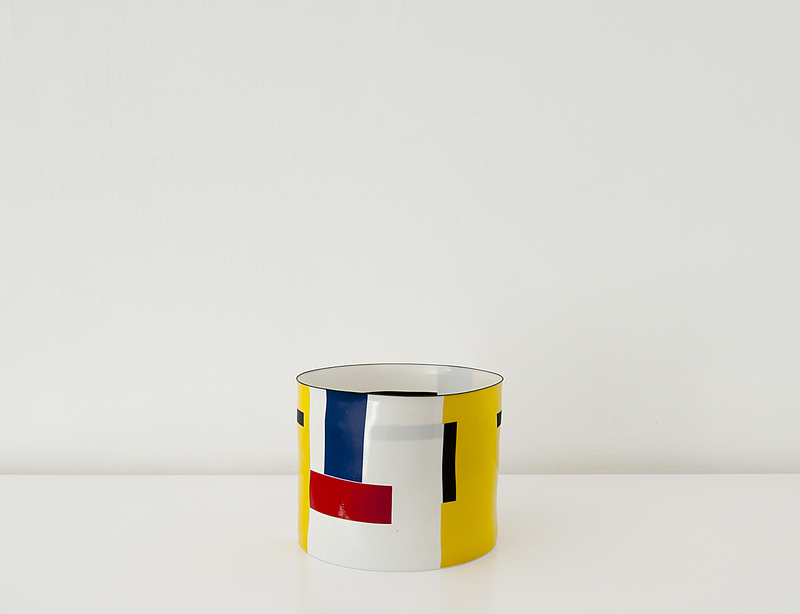 Puls Contemporary Ceramics represent Bodil Manz exclusively in Belgium. Bodil Manz (Personal show 2008), Bodil Manz (Personal show 2004), Bodil Manz (Personal show 2011), .